Liz Carey is the author of 36 published books for young readers. 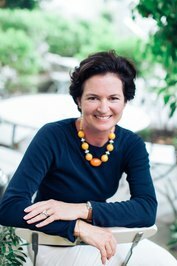 She is also the Publisher and co-founder of Dunemere Books, a boutique publisher of travel fiction: stories with a strong sense of place. A former children's book editor (Golden Books, Workman, Planet Dexter) and bookseller (The Harvard Bookstore), Liz lives in New York City with her husband, three sons, a high-maintenance cat named Yankee and a chunky Pug named Noolah. Please visit www.elizabethdoylecarey.com and www.dunemerebooks.com. To ask Elizabeth Doyle Carey questions, please sign up. So many kids today are the children of addicts. This is a horrible and intolerable fact. Jarrett Krosoczka’s sensitive autobiographical graphic novel is a dip into the life of just one of the many young victims of drug-addicted America. It is also just the thing to share with any middle grader touched by drug use. We’d love your help. Let us know what’s wrong with this preview of Birds of a Feather by Jacqueline Winspear. We’d love your help. Let us know what’s wrong with this preview of Maisie Dobbs by Jacqueline Winspear. We’d love your help. Let us know what’s wrong with this preview of Merci Suárez Changes Gears by Meg Medina. We’d love your help. Let us know what’s wrong with this preview of The Brothers by Asko Sahlberg. We’d love your help. Let us know what’s wrong with this preview of Upstream by Mary Oliver. This group is for all Teenreaders to discuss young adult books they are reading and current trends in YA publishing.